Just hours from now I get up and return to work. A week off doesn't seem like nearly long enough. 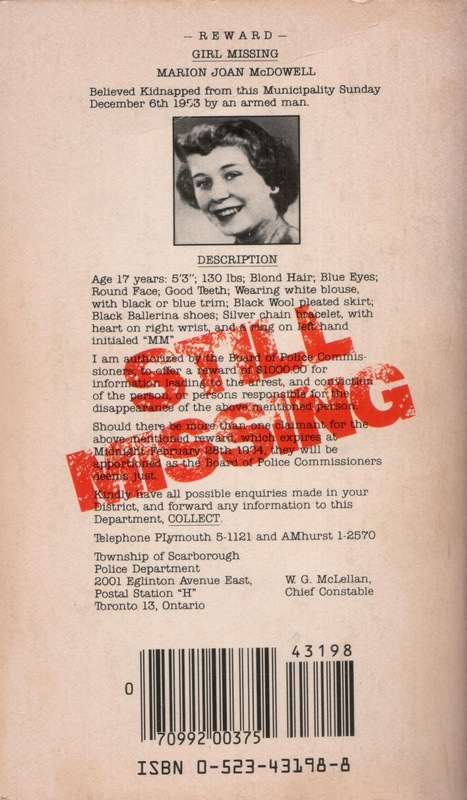 Tomorrow another cold case article goes live on the Frank Magazine website. It will be in the printed magazine that goes on sale on Wednesday. It is about a man who was murdered nearly 38 years ago. The details of this man's murder are especially troubling, and it is a travesty that his murder has never been solved. When I was in the Frank Bunker on Thursday, Cliff told me that I was Halifax's Max Haines. I get where he was coming from, but I was quick to point out that I have never cared for Haines' writing style, which has always struck me as lurid and disrespectful toward the victims. Now, here is a writer of true crime that I like a great deal, and I think you would like him, too. Derrick Murdoch reviewed crime literature for the Globe and Mail for 20 years. 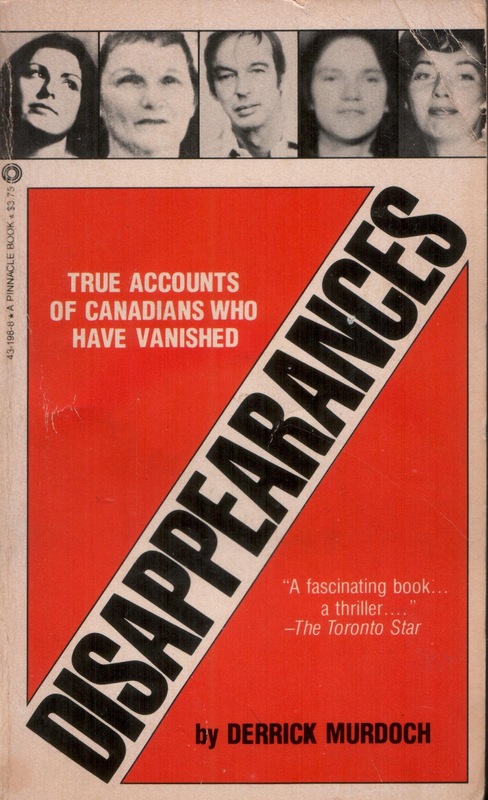 When he published "Disappearances" in 1983, he was revered. 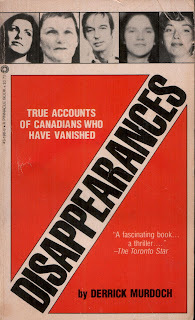 He won the first Chairman's Award of the Crime Writers of Canada in 1984, probably because of this book and his other body of work at the Globe. After he won it, they renamed the award in his honour, where it is given out biannually to the present day. Murdoch died in 1985. I still remember buying this book. I had just moved to the city, so it was maybe May of 1988. I was living at 55 Dahlia Street in Dartmouth, close to Sullivan's Pond. Knew virtually nobody in the city, at least nobody who gave a damn about me, and whether I lived or died. I was trying to find my way around the city, which was a big job for a Valley boy. I found Penhorn Mall and its huge fleamarket, one Sunday morning. I walked around and got some stuff. On my way out, nearly at the door, I saw this very book, the one whose cover I scanned in a moment ago, on a bookshelf along with other books some guy was selling. Fifty cents. On a lark, I bought it. I got back to my little bachelor apartment and cracked open the book. And reading it scared the living hell out of me. I would parcel out a chapter a night, max; and there were nights when I knew that if I read any of it, I would not be able to sleep that evening. Every little sound outside my apartment door, every car driving past my building, every voice in the parking lot, took on an added resonance, while I was making my way through this book. 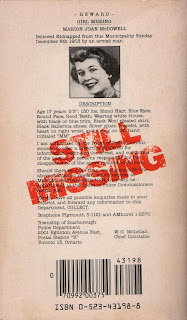 This book remains the single best one about missing persons cases in Canada that I have ever read, or even seen. It should be required reading for anybody who has any interest in this topic. And it should be reprinted for a new generation to read, savor, and appreciate. Derrick Murdoch is the writer I would most like to be like. He was that good. No. You can't borrow my copy. Get your own. I should turn in. I know there is a lot of work waiting for me tomorrow morning.